The preferred place of death is an important consideration in end-of-life care, especially when the dying person is definite about their choice. The preferred place of care may well be the same location, but this is not always the case. When the two venues are different, and the patient’s prognosis is poor, a decision has to be made whether to move the patient or not. The expectation to not only transfer the dying person in a timely fashion but also to minimize the time in the current setting often makes the situation a palliative care emergency. However, should the move occur at all? The risk of dying in transit may be high. Furthermore, respecting the wishes of the dying person needs to be balanced with the practicalities of safe ongoing care. These are practical and ethical decisions that should be made as early as possible. How do we facilitate the smooth transfer from one location to another? Coordination and communication are vital in planning the process and supporting the discharge. The provision of the right medications and equipment, relevant information, and strategies for managing future problems should increase the chance of a successful transfer. Sometimes a smooth transfer will not be possible, but patients and family members will usually be happy with a successful one. Bone AE, Gomes B, Etkind SN, Verne J, Murtagh FE, Evans CJ, et al. What is the impact of population ageing on the future provision of end-of-life care? Population-based projections of place of death. Palliat Med. 2017; 269216317734435. https://journals.sagepub.com. Gage H, Holdsworth LM. Impact of a hospice rapid response service on preferred place of death, and costs. Biomed Chromatogr. 2015. bmcpalliatcare.biomedcentral.com. 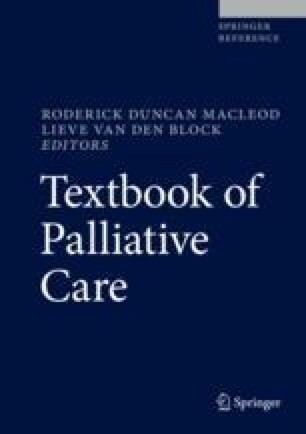 Available: https://bmcpalliatcare.biomedcentral.com/articles/10.1186/s12904-015-0065-4. Lin Y, Myall M, Jarrett N. Uncovering the decision-making work of transferring dying patients home from critical care units: an integrative review. J Adv Nurs. 2017. Wiley Online Library; Available: http://onlinelibrary.wiley.com/doi/10.1111/jan.13368/full. Wahid AS, Sayma M, Jamshaid S, Kerwat D’A, Oyewole F, Saleh D, et al. Barriers and facilitators influencing death at home: a meta-ethnography. Palliat Med. 2017; 269216317713427. https://journals.sagepub.com.